This year I had the privilege of participating in the 31st Annual AIDS Walk OC & Red Ribbon 5K Fun Run. Thanks to everyone who donated, including ehsInc, I was able to meet my donation goal to benefit people living with HIV/AIDS in Orange County. This money will provide things like preventative education, free HIV/AIDS testing, food and so much more to those who need it most. I'm honored to have been a part of an event full of caring people which reminded me how important it is to give back and help one another. 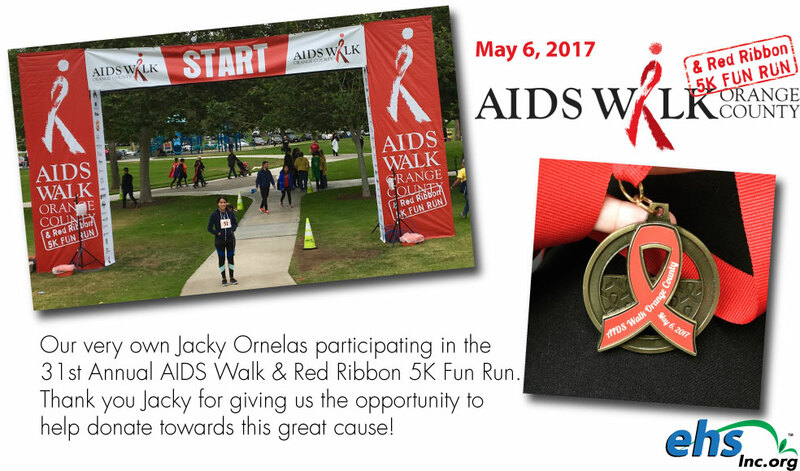 The energy of the organizers, participants, and volunteers I felt that day speaks to the commitment they have to care for people with HIV/AIDS and to help eradicate the disease. Although, this was my first 5K it definitely won't be my last. I'm already looking forward to starting a team to enter in their 32nd Annual walk/run in order to surpass what I raised this year!